Product prices and availability are accurate as of 2019-04-09 17:47:02 EDT and are subject to change. Any price and availability information displayed on http://www.amazon.com/ at the time of purchase will apply to the purchase of this product. With the Canon Photography Workshop 2003 Gold, you'll begin taking better photographs in no time! 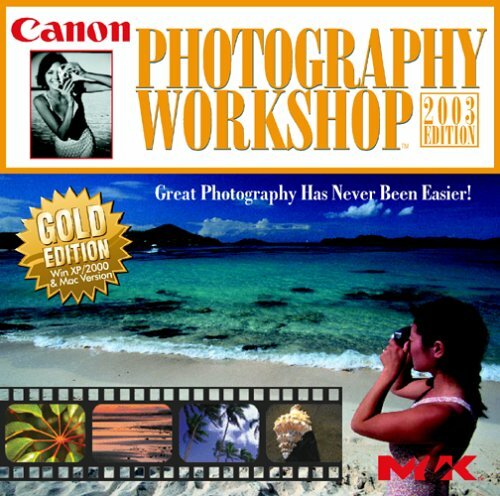 This software tool shows beginners the basic principles of photography, and preapres them for taking pictures in every setting Full set of interactive media lessons teaches important prnciples -- you scroll through them with controls that mimic a real camera Try out different combinations, different compositions -- see how different techniques work Experimenting is encouraged here -- you'll gain more experience by practicing with Canon Photography Workshop, and that means less mistakes when you're out taking pictures in real life!